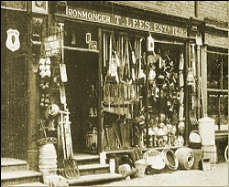 For two hundred years there had been a hardware shop located at 72 King Street, Knutsford, Cheshire but sadly eventually the business had failed and the shop was standing empty. In 1992 Valerie Byles, the current Managing Director of Wares of Knutsford, decided that the rat race was no longer for her and loving her adopted home town as she did the idea of Wares of Knutsford was born. The stock for the shop was developed based on a request book kept on the counter and in next to no time the shop became known as an Aladdin's Cave where customers received a personal service and good old fashioned courtesy. The business grew rapidly and moved to larger premises in Princess Street, Knutsford, where customers could find hardware, ironmongery, kitchenwares, pet supplies and a wonderful range of gifts. Sadly though, as has been the case in many small towns, the shopping culture began to change and with the expiry of the lease and hugely increasing overheads the retail outlet of Wares had to close down. The business then became internet based and evolved into the ever expanding mailorder company it is today. Preserving became the focul point and over the last twelve years a wide range of jars, bottles and preserving equipment has developed. Our traditional range of enamelwares has been popular for twenty years and in fact even more so nowerdays with the vintage look being in vogue. In the same way our pottery ranges especially Mason Cash with the traditional mixing bowls and oven dishes are still as popular now as they were at the beginning. Although the traditional ranges will always be found at Wares of Knutsford; following the launch of a new website in 2018 the intended direction is to keep up with current trends too and to always ensure that items are of excellent quality. The new website has a vintage flavour and is designed to give our customers an enjoyable browsing experience with a very user friendly approach to purchasing. At Wares of Knutsford, we pride ourselves on offering good old-fashioned, friendly customer service and always aim to "go the extra mile" to help our lovely customers. A far cry from the impersonal experience of larger retailers such as Amazon, Wares offers not just a great range of glassware, preserving and kitchen items, but also a helpful community and a wealth of experience in all things preserving and bottling! We are a small family-run team and really like to personally look after our customers, many of whom we have come to know well. As you will see, our website is jam-packed (literally) with a huge range of jam jars and glass bottles, but still we are able to source more! If you are looking for a precise shape or style of glass jar or glass bottle that we do not currently stock, we will always try our very best to source it at the most competitive price. In the unusual situation that we cannot help, we will endevour to point you in the direction of someone who can! Customers are welcome to visit our warehouse and purchase goods if required. We are based two miles North of Holmes Chapel turning right into Goostrey Lane off the A50 going towards Knutsford or coming from Knutsford it is 8 miles on the A50 going towards Holmes Chapel, turning left off the A50 into Goostrey Lane just after Woodside Golf Club. Our warehouse and shop address is Wares of Knutsford Ltd., Unit D, Cranage Trade Park, Goostrey Lane, Cranage, Cheshire, CW4 8HE. Telephone No: 01477 537224. Email: info@waresofknutsford.co.uk. Website: www.waresofknutsford.co.uk.